(MENAFN - Jordan Times) AMMAM — Minister of Foreign Affairs and Expatriates Ayman Safadi on Thursday paid a working visit to Iraq, where he discussed with the Iraqi president, prime minister and FM bilateral relations and regional developments. During a meeting with President Barham Saleh, Safadi conveyed His Majesty King Abdullah's congratulations for the leader over assuming the presidential post, according to a Foreign Ministry statement. Safadi voiced the Kingdom's keenness on strengthening cooperation with Iraq in all fields. 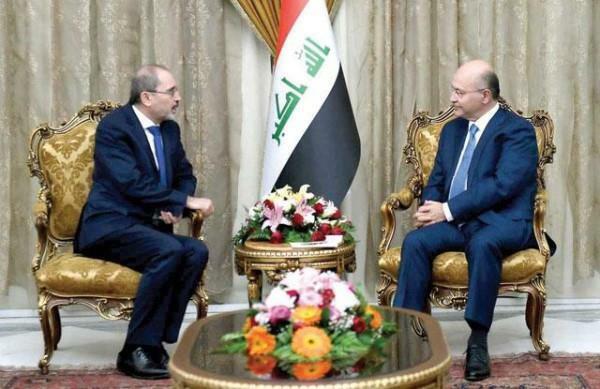 Safadi also met with Iraqi Prime Minister Adel Abdul Mahdi, underlining Amman's support to Baghdad and the new government during this crucial stage. An expanded meeting was also held between Safadi and his Iraqi counterpart Mohamed Alhakim over bilateral ties and the latest regional developments. The two ministers agreed to form a taskforce of professionals to discuss the practical steps to translate the political will in order to deepen the relations, set a roadmap for the implementation of vital projects between the two countries and remove all obstacles to increase economic and investment exchange. The top diplomats stressed that the two countries are keen to move forward with the projects of electricity interconnection, energy and transport, as well as increasing the volume of trade exchange. Safadi and Alhakim also stressed the need for the two countries to proceed with implementing the project of oil pipeline from Basra to Aqaba and the project of electricity interconnection, in addition to developing work mechanisms of the Al Karama-Turaibil border crossing in line with plans to enhance regional cooperation in the fields of energy and transport. The two officials discussed the latest developments in the Palestinian issue, stressing the necessity of boosting efforts to resolve the Palestinian-Israeli conflict on the basis of a two-state solution that guarantees the establishment of an independent Palestinian state within pre-June 4, 1967 lines, with East Jerusalem as its capital. They also called to a political solution to the Syrian crisis that ends the suffering of the Syrian people and preserves the unity of Syria.